Stripe is an online payment system to accept payments from your clients via credit card, the same way that PayPal allows your customers to pay online. 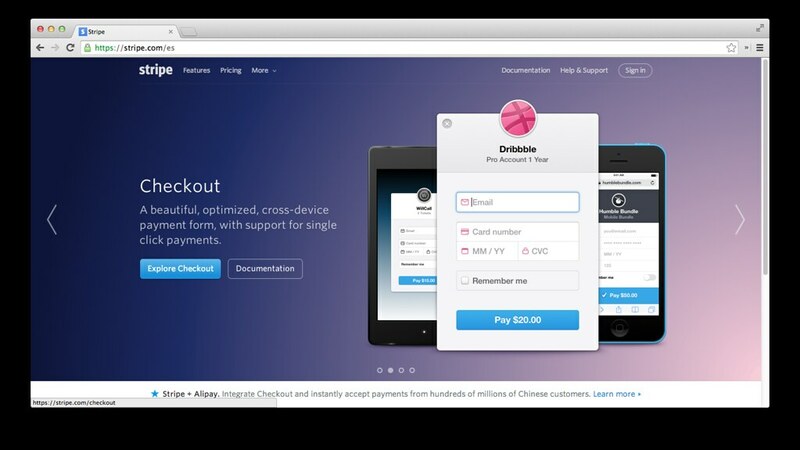 With Stripe, there are two main methods to charge your clients: Checkout and Stripe.js. The user fills a form with credit card information. Stripe processes it, and sends a token that identifies that card details, so you don’t have to deal with security issues. Then you charge the card —at the moment of the payment, or anytime in the future— using Stripe’s API, and the card’s token. Basically, the token gives you access to charge the client once. When charging, through a synchronous process —which means that no IPN notification has to be sent— Stripe will charge that card for the amount you specify. If the payment method is rejected, Stripe will throw an error. The web library provided by Stripe is available in Ruby, Python, PHP and Node JS. Apart from this web payment method, Stripe offers a mobile API for both iOS and Android platforms, and a Subscription plan to charge your customers, for example, in a monthly basis.